Add this issue to your photographic library for EOS-specific information as we review Canon's EOS 5D MarK IV camera plus in-depth technique articles on moving images, focusing areas, Wi-Fi and much more. Moving image - Anatoleya has perfected the technique of combining movement with portraiture. Shop - A round-up of the latest photo products in our online shop. Ask the EOS experts - We answer your photographic questions. Camera Functions - Focusing areas. Band of rebels - Drew Doggett takes on the legendary white horses of the Camargue. The low down - Lowering your viewpoint. Lens variations - How to choose the right on for you. Wi-Fi - Wi-Fi options built-in, transmitters and Canon's new Wi-Fi adapter. Date and time - Reasons why you should update the date and time. Weather report - What Canon does to exclude the elements from your camera. 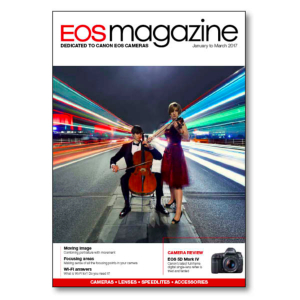 Battery Safety - A review of risk factors with batteries used in EOS cameras.